For many community engagement activities undertaken by students, air travel is the single most expensive item and often a significant barrier to participation. Through the use of donated AEROPLAN Miles, we’re able to help cover air travel expenses for eligible uOttawa students undertaking community engagement activities in communities where air travel is required. 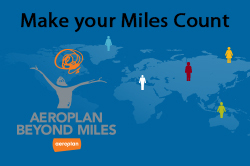 Students can use the donated miles only for travel to locations serviced by Aeroplan partners. *There is no blackout period for using Aeroplan Miles on Air Canada flights, but they are subject to availability. For all the other Aeroplan partners, blackout periods or flight limitations may apply. The program is subject to change at any time according to Aeroplan rules and regulations. – attend the Centre for Global and Community Engagement (CGCE) international pre-departure training and post-service debriefing if they do not have already access to such training as part of their community engagement project or service learning activity. Send your application via email to the AEROPLAN selection committee (servingothers@uottawa.ca). (Indicate “AEROPLAN CHARITABLE POOLING PROGRAM” in the subject line). Your professor must send your letter of recommendation via email to the AEROPLAN selection committee (servingothers@uottawa.ca). (Indicate “AEROPLAN CHARITABLE POOLING PROGRAM” in the subject line). Please note that it is the responsibility of each applicant to ensure that the above documents are received by the Centre for Global and Community Engagement before the deadline. Application deadline: All proposals will be reviewed and addressed at the earliest convenience. The committee may meet at the end of each month or more frequently according to the demands and available Aeroplan Miles. Review of applications: 3-4 times per semester when a critical mass of applications has been received. Special selection committee meetings can be organized to address urgent requests, particularly in the months leading to summer when students tend to travel more for international or local volunteering. Announcement of winners*: Following review of applications by selection committee.